Since my exercise and weight loss journey began in the middle of 2014, I have lost about five inches off my waist (34 inches to 29 inches). That custom tailored double-breasted suit from Hong Kong that I got in the summer of 1995? I’m glad that style is coming back into fashion because the muffin top is gone, and the suit fits me again! Those durable North Face shorts I wore on my Desolation Wilderness backpacking trips in the late 90s and early 2000s but hid in my closet the last decade because they had gotten too tight? Time to start planning another backpacking trip because they’re loose and comfy now! 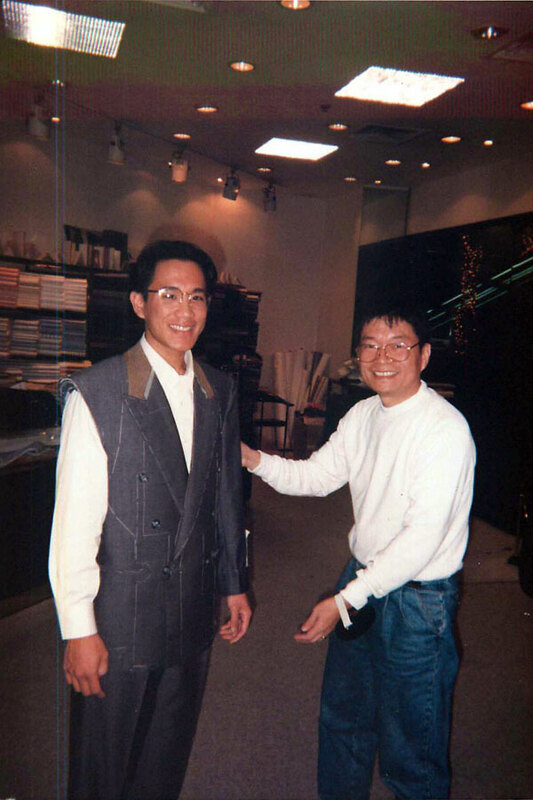 Getting my suit fitted and adjusted in Hong Kong circa 1994. After my weight loss, it fits again! Seeing that the clothes I’ve been wearing the past several years are now too big, I’m jumping head-first into this sartorial opportunity to do something I’ve long wanted to do but was afraid to commit to: creating a minimalist uniform for myself. I’ve been inspired by people like Steve Jobs, Albert Einstein, Mark Zuckerberg, President Obama and others who have adopted a minimalist clothing approach or a personal uniform. They’ve chosen to wear the same or identical clothes every day in order to concentrate on the things that are most important to them instead of wasting time on deciding what to wear. While my daily decisions don’t yet affect the financial future of multi-billion, multi-national companies nor the fate of the free world, I can still benefit from simplifying my life and freeing myself of the clothing decision every day. Mark Zuckerberg is known for his gray t-shirt and hoodie. The late Steve Jobs was known for his black mock turtleneck and blue jeans. 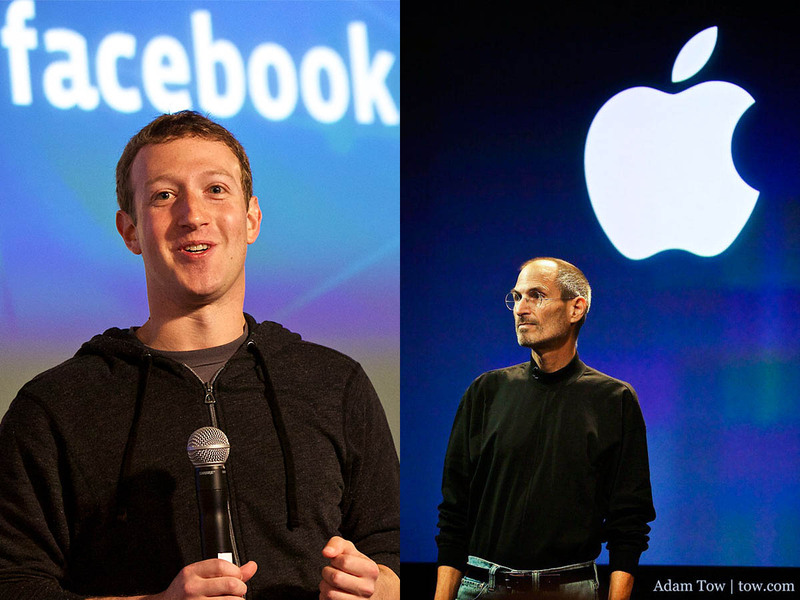 I took these photos at the Facebook Graph Search (2013) and Apple Antennagate (2010) presentations. Unlike these powerful and famous individuals, I don’t have the budget nor desire (yet) to buy dozens of copies of the same outfits, so my minimalist uniform choice has durability requirements along with an added social component. There are two memories from my youth and college years that I think were the original seeds for this notion of adopting a personal uniform. In high school, I can’t remember a day when my friend Jared Polis wasn’t wearing slacks and a turtleneck. While the colors changed daily, the style was almost always the same. Today, Jared’s wardrobe consists more of polo shirts and suits now that he’s a three-term US Congressman from Colorado’s 2nd District. J*** was right, but I didn’t want to accept what she was saying at the time. Isn’t that how it always seems to be when looking back on your life? How I wish my future self could have had a conversation with my younger self about the value of minimalism and the personal uniform! Just outside the frame of this photo were the other pieces of heavy and bulky luggage I was bringing back to the US. 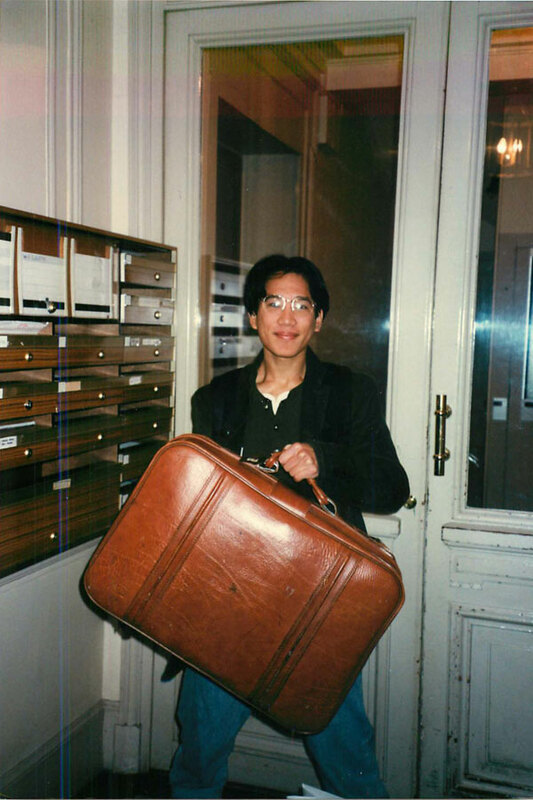 How I wish I had a uniform or a minimalist clothing and packing strategy when I was living in Paris in 1995! Since then, I’ve gotten a lot better at packing for travel. 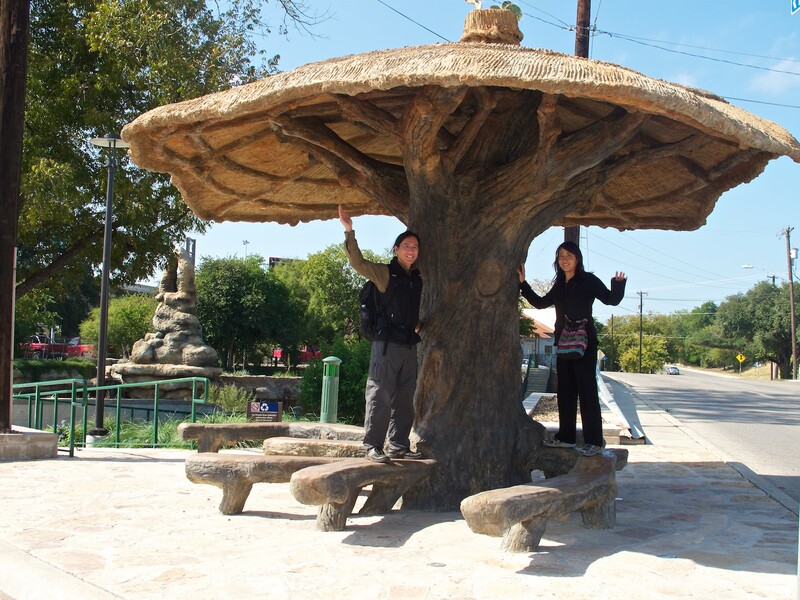 From our vacations in Europe, tours of Autumn Gem around the world, and our two trips to South Korea last year, Rae and I typically brought just two school-sized backpacks with us. If it was absolutely necessary, we brought along a small rolling suitcase. I’ve been able to pair down my clothes to either two or three outfits, but I’ve always want to be able to travel with just the clothes on my back and be ready for any situation. Could I apply that same desire to my everyday life? Our current travel packing strategy consists of choosing clothes that can be worn multiple times between washings, could be washed in the sink, and featured quick drying fabrics. A lot of my clothes come from either REI or Scottevest. They are functional, but I do find them lacking in the style department. My biggest frustration with these clothes is that they make me look like a tourist. Under a Carlos Gomez sculpture along the Riverwalk in San Antonio, Texas. Our travel clothes were functional if not stylish. The famous people I mentioned above probably didn’t or don’t concern themselves with what other people thought about their clothing habits. Had they earned that right by virtue of being successful and powerful? Or can anyone adopt that attitude? If I’m going to adopt a uniform or minimalist clothing strategy, I’d like the clothes to be both functional, durable, and stylish (to a degree). Enough with the preamble and background. Let’s talk about what I’m actually going to be wearing for the next several months (to start out with) in 2015. I first read about the Wool and Prince better button-down dress shirt from one of Tynan’s annual gear posts. I’ve grown tired of taking my stable of cotton dress shirts to the cleaners after they get all sweaty and wrinkled from wearing them for just a single day and am eager to test the magical properties of this fine merino wool dress shirt. Wool and Prince started out as a successfully funded Kickstarter project in 2013. I ordered the button-down oxford in gray. The shipment came in two days and was well packed. The shirt doesn’t feel like the thick wool you might have worn as a kid, nor does it feel scratchy like some of the synthetic shirts I have. To me, it looks and feels like a regular cotton dress shirt. I chose this shirt because it can be dressed up or down and worn tucked in or out. The grey is a neutral color compared to the colorful gingham styles of the other W&P button-downs. While the shirt is expensive at $128, it’s about the same price as I paid for my Ralph Lauren dress shirts that I hate having to launder. If this shirt stays clean, stink-free and wrinkle-free for three months, it’ll be worth it. Since I plan to wear this shirt for the next 100 days — 2 down, 98 to go — I really hope it can hold up to everything I will be throwing (and pull-upping) at it without getting wrinkled, smelly and worn. I’m going to be more liberal with my pants choice for my daily uniform. 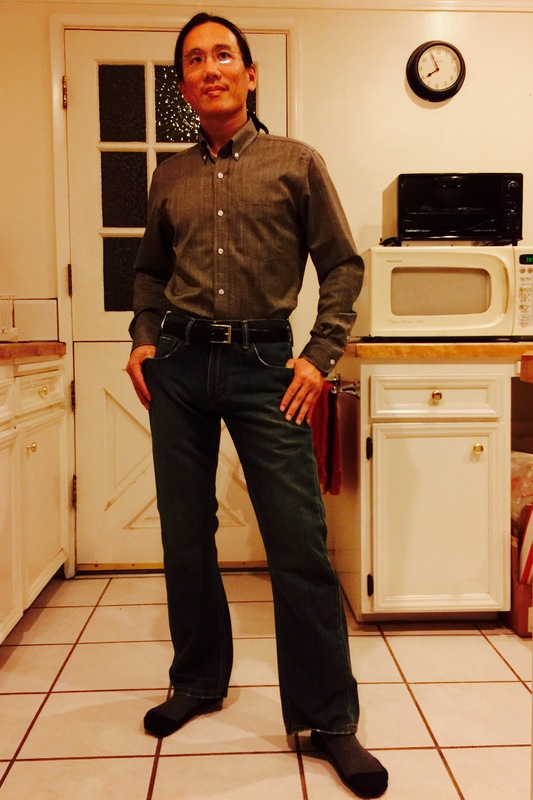 I bought a pair of Levi’s Relaxed Fit 559 jeans in blue and a pair of black Bluff Works pants. I’m also getting my Scottevest black Hidden Cargo Pants altered to bring in the waistline. That’s a lot of promise for a pair of pants, and I’m eager to try them out when they arrive in about a week. Since pants sizing and fit is so personal and hard to judge looking at numbers on a website, there may be some back and forth between me and Bluff Work’s customer support over the next several weeks. Until then, I’ll be wearing the Levi’s 559 jeans. These three pants will form the bulk of my daily wear, though I may pull out a different pair of pants from my closet for special occasions. I will be the first person to admit that I have way too many hoodies and jackets. Every conference I went to over the past eight years has handed out some kind of outerwear. Lately, I’ve been wearing a Marmot Ajax down jacket that I got from Re/code. It’s perfectly warm for the mild winters we experience in the Bay Area; the only downside is that it’s a size medium, and I’d prefer a small. I’ve long been a fan and promoter of Scottevest clothing. The extra pockets in their pants and jackets allow me to carry all of my digital accessories (no minimalist strategy here with my gadgets!). That said, I’ve always found myself in-between sizes with their clothing. Up until now, I was too big for a small and too small for a medium. For spring, summer, and fall, I will wear my Scottevest Travel Jacket (Women’s Large fit me the best) in vest mode in the interim while I look into one of their newer jackets/vests as a future purchase. I might add a touch of color with that purchase, seeing that my wardrobe is very muted with grays, blacks, and dark blues. Finally, I’m also considering altering one of my blazers to my new size and just wearing that when I’m out and about. Three pairs of shoes will remain in my regular rotation: My current running shoes, a pair of Rockport shoes in black, and a pair of waterproof trail running shoes from Ahnu. 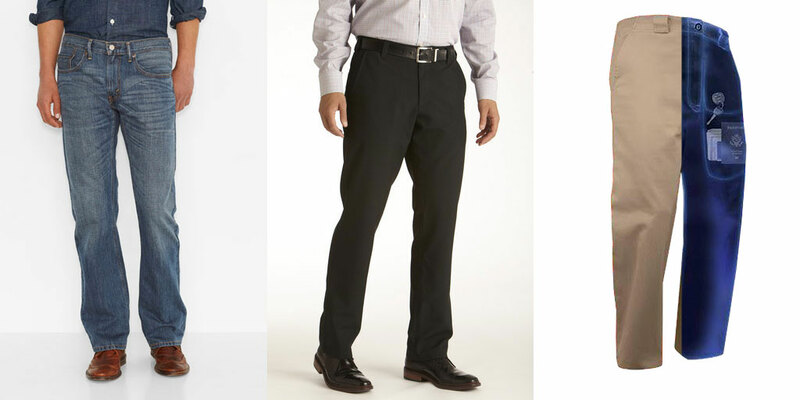 Since I won’t be running in my uniform, I’ll probably be wearing my Rockport shoes the most, seeing that they’ll go better with my Bluff Works and Scottevest black pants. The Ahnu shoes work best with my Levi’s. Home: Anything goes. I can wear whatever I want to. I realize that because I work primarily from home, I do have an out with rule number one. I have a lot of soft, cotton t-shirts (all of them given to me for free at various conferences and events). Perhaps later this year, I’ll buy one of Wool and Prince’s t-shirts and wear that around the house. I could save on laundry/water costs each month… hmmm… maybe I’ll be updating this post sooner rather than later. As for rule number two, I’m primarily running and doing bodyweight exercises (mostly pull-ups and push-ups) these days, with the occasional bike ride thrown in from time to time. I don’t spend too much mental energy thinking about what to wear since I only have a limited selection of exercise clothes. I’ll take special occasions on a case-by-case basis. Not that I have been invited to any black tie events planned this year, but I do have a tuxedo sitting unused in my closet! Day one of wearing my new personal uniform. This is my first attempt at creating a uniform for myself, and I don’t know if the choices I’ve made this week will stick for the entire year. On the original Kickstarter description page for his better button down shirt, the founder of Wool and Prince wrote, “A wool shirt worn for 100 days straight. No washing. No dry cleaning. No wrinkles. No odor.” I’m going to follow his lead and wear this personal uniform for the next 100 days. I won’t be washing the shirt nor the pants unless there’s some egregious stain on them. May the toddler gods smile upon me. I’m hoping that at the end of this project, the clothes will look as new as they did when I bought them, Levi’s jeans (knee area, I’m talking to you) and shoes aside. As for my current clothes, they’ll shortly be going into the guest room closet; if this personal uniform and minimalist clothing strategy works for me, I’ll be donating them all at the end of the year. There’s a liberating feeling when I’m able to push beyond sentimentality and get rid of old things that have outlived their usefulness. It’s hard sometimes to make the decision, but I have always felt better afterwards. Out with the old, and in with the new! Finally, for my friends, family, and work colleagues, I hope you forgive me for making every day seem like the same day when we take photos together! For those people who realize that I’m wearing the same clothes every day, I’ll point them to this post. The pic of you from a couple decades ago is great; you looked so young! What I wear at home is pretty much the same thing every day. T-shirt and comfortable shorts or pants. At least for me, 20 years doesn’t seem so long ago; I hope I’ve aged well. I feel better now than perhaps at any point in my early to late thirties. I’m in the process of building my personal uniform for work and stumbled upon your website! Been looking for a nice shirt and thanks to your recommendation, I purchased 7 button-down shirts from Wool and Price to try. Hope they work out :). Thanks! Tri – Good luck with your uniform project! I’ve been enjoying the W&P shirt (after getting the sleeves shortened). Did you buy 7 different colors or 7 of the same design?